Protect your deduction by validating that a charity is eligible to receive tax-deductible contributions before you donate. Of course, additional rules affect your charitable deductions, so please contact us in Brea (714.990.1040) or Visalia (559.732.4135) or click the button below if you have questions about whether a donation you’re planning will be fully deductible. We can also provide ideas for maximizing the tax benefits of your charitable giving. 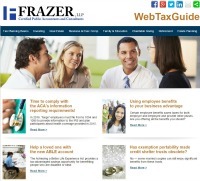 Frazer, LLP recently hosted a complimentary webinar, "Are You Ready for the New ACA Employer Reporting Requirements?" with guest speaker Ruthann Laswick, President, Blue Water Benefits Consulting in conjunction with Brown & Brown Insurance Services of California, Inc. You can now view the webinar recording and download the handout.